We are dependent on donations. The low membership fees are not enough. TEB commitment’s high efficiency is secured by over 30 voluntary workers, many of whom experienced the illness as relatives, including the psychological changes that many patients go through. TEB is mostly staffed by volunteers and has little funds to plan with. Low membership fees and project sponsorship according to § 20 h in the Code of Law are not sufficient. That’s why we urgently require donations. 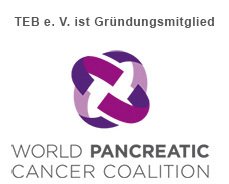 It is important to publicise the enormous challenges of pancreatic cancer and anchor them in public consciousness, so that we can continue with the necessary work. It’s the only way to ensure that the people affected by this terrible illness are not also forgotten. At the cash-desk at the supermarket, at the baker’s, at ticket machines – often you get lots of small cash back as change – filling your purse, but not worth very much; certainly not enough for the next grocery shopping. However, what’s not so valuable for us, can be of considerable help elsewhere. We were able to show this in the past two years with our donation campaigns for TEB. Last year €2.149,57 was donated – a substantial amount. How is your donation put to use? 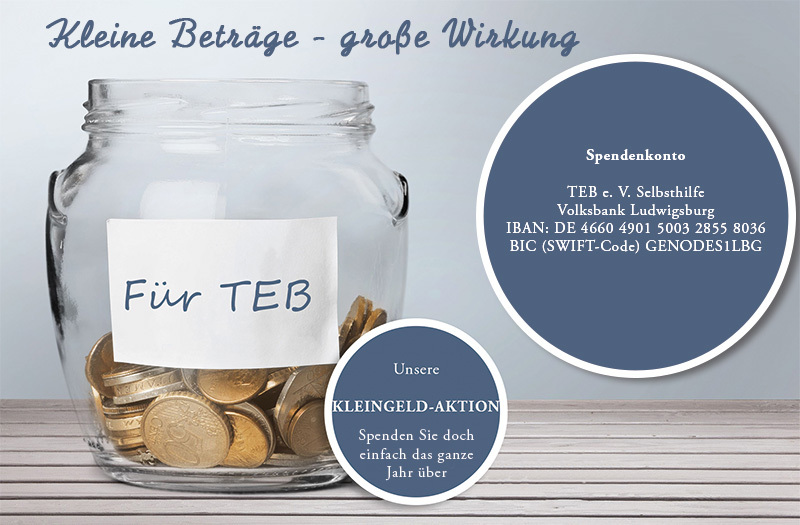 Although many people support TEB Selbsthilfe by working as volunteers, still considerable financial help is necessary to cover all the costs. Amongst those are the organizing of workshops, seminars and cookery courses, production and printing costs of magazines and flyers etc., travelling costs to the group meetings and also to help affected people directly and much more. Despite regular contact with different organisations and companies, it is often very difficult to secure financial aid. So, very penny helps us to continue our support for affected people and their loved ones – and also to increase it. We thank each and every one of you, who has donated his/her loose change to our campaign. Find something to save your pennies in, e.g. a savings bank, a screw top jar or tin in which you collect all the loose pennies from your purse (to save you carrying them around with you) up to 31st. December. It doesn’t need to be a lot – a few pennies each time – whatever you can do without. At the end of the campaign pay the collected loose change into your bank account and donate this amount per bank transfer to the TEB Selbsthilfe donations account. Your reference should be: “Kleingeld-Aktion”. Early in 2018 we’ll be reporting the success of the campaign in our magazines and on the website.